Blizzard Entertainment is one of Mac gaming’s favorite game publishers, and it’s little wonder why: It’s one of the only mainstream game makers to treats Macs and PCs as equals, offering its products for both platforms simultaneously (most often, on the exact same discs). 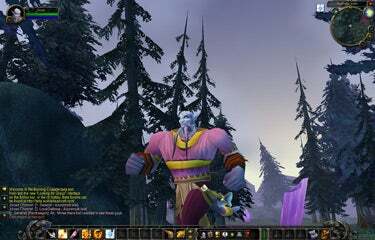 So when World of Warcraft ( ) hit the streets late in 2004, it instantly became the Mac platform’s favorite online role playing game. Blizzard has reaffirmed its dominant position with the recently released World of Warcraft expansion pack, The Burning Crusade. The Burning Crusade, which I took a first look at in October 2006 when the expansion pack was still in beta, offers a wealth of new content and new capabilities for this venerable massively multiplayer online game, including a new continent for high-level players to explore; two new playable races, new quests; new monster types and dungeon instances; a new profession; and lots of other stuff. While it’s not absolutely necessary to play The Burning Crusade in order to enjoy World of Warcraft, it certainly will renew the interest of veteran players who may have grown tired of the repetitive nature of “grinding” characters up to Level 60 only to be stymied by what else to do. The two new playable races in World of Warcraft—the Draenei and Blood Elves—are aligned with the Alliance and Horde, respectively. The Draenei are blue-skinned aliens who have crash landed on the world of Azeroth after fleeing a vicious enemy who has destroyed their homeworld; the Blood Elves are cousins to the Alliance-aligned Night Elves, but focused on darker magic and better suited for life with the Horde—Orcs, Tauren and the Undead. Like the other character races you can play in World of Warcraft, the Draenei and Blood Elves both have their own specialized areas where you can be introduced to the races, a bit of their back story, and where you can pretty safely get your own character up to a level where it’s advisable to go out into the more dangerous realms in this fantasy world. Although both new races have their own attributes and technology that make them unique in Azeroth, much of the experience is the same as you’ll have with every other playable race in World of Warcraft. A whole new world The blue-skinned Draenei join the Blood Elves as the newest playable races in the World of Warcraft: The Burning Crusade expansion pack. Jewel-crafting is a new profession that’s been unlocked in the Burning Crusade. It enables you to take raw gems (which you can find by mining or occasionally as loot on the corpse of one of your dead enemies) and turn them into magic rings, necklaces and other objects that can be used to either increase (or “buff,” in adventure gamers’ parlance) your powers or those of other players who you’re playing with. Another new aspect to the game is something that should ring familiar with fans of another, older Blizzard game: Diablo II. The concept is “socketed” items—weapons and other objects whose attributes can be enhanced by placing a gem or other precious item in an available socket. Placing items in sockets may enhance the user’s health, for example, or improve a magic user’s intellect to make spells more efficient; they can also improve the attack power of some weapons. Outland is an entirely new continent you can explore, provided you have a high enough level character. (Don’t even think about it unless you’re into your upper 50s.) This continent, actually a fragment of the orc’s homeworld accessible through a dimensional portal, provides experienced users with a playground of their own. It’s rife with new dungeons, player vs. player (PVP) arenas and quests to participate in. It’s also the land of Wyverns—flying mounts that those with enough experience (and enough gold) can take and fly wherever they wish. You can’t, for example, drop bombs from your Wyvern, but it makes for quite a dramatic entrance, and it’s a heck of a status symbol. After more than two years, World of Warcraft (and, by extension, the Burning Crusade) is starting to show its age a little—graphics are looking a little too angular, and lighting and shadowing effects seem a bit primitive. It’s not as spectacular and gorgeous as it used to be. Having said that, it’s still a great-looking game, and if you’ve been keeping your account up to date (even if you haven’t bought The Burning Crusade) then you probably know that Blizzard has updated the game with support for multithreaded OpenGL. If you’re using a multiple core Intel-based Mac running Mac OS X 10.4.8 or later, this will result in better performance, especially in areas populated by large “mobs” or excessive geometry (such as big cities, like the Dwarven stronghold of Ironforge). When the Burning Crusade first bowed in January, it was available exclusively as a CD or DVD pack you had to buy in a retail store. Now, however, it’s available for download—all you need to do is upgrade your account and buy it online directly from Blizzard; it will be downloaded to your machine. You’ll obviously need a reasonably fast, persistent broadband connection, because the download measures in gigabytes, not megabytes, but it’s a good way to get the game if you can’t get to a retail store. The Burning Crusade will help to renew interest in World of Warcraft, and gives inexperienced players a wealth of new features to explore. It’s definitely worth the upgrade.